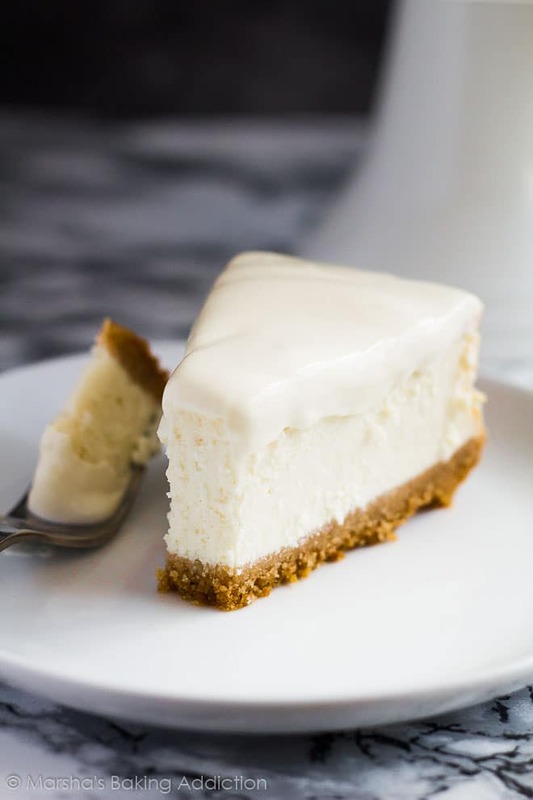 Perfect Vanilla Cheesecake – Deliciously creamy vanilla cheesecake on top of a cinnamon spiced digestive biscuit crumb crust and topped with a sour cream topping! 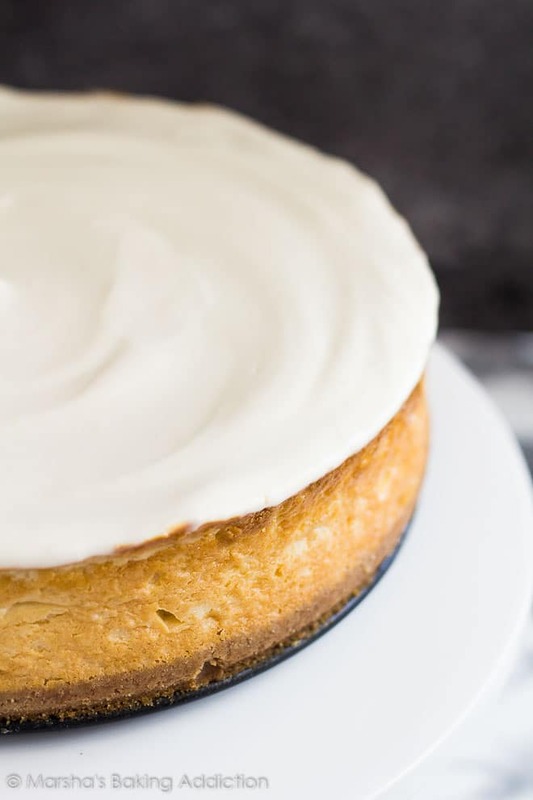 This is my third attempt at making a full-sized cheesecake, and I’m happy to say I’ve found my favourite recipe for a scrumptiously perfect vanilla cheesecake. After hours standing in the kitchen, baking away, I can finally say I bring you my recipe for the most perfect cheesecake you’ll ever make! I’m not surprised others find cheesecakes so daunting to make. Baking away in the kitchen for hours only to find your cheesecake has sunk, browned too much, or has a huge crack in the centre. Ugh! 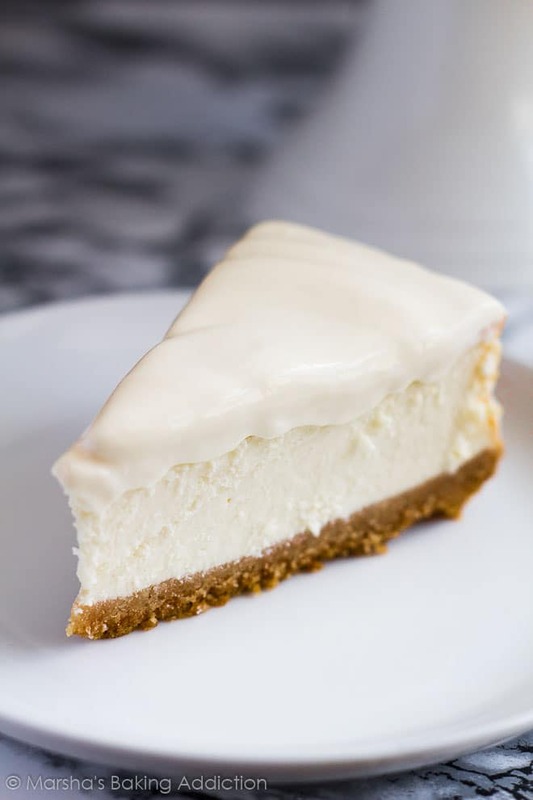 The cracked cheesecake is the most common. There are a few ways to help prevent your cheesecake from cracking. You can either bake it in a water bath (placing the cheesecake pan in a larger pan filled with hot water) which I have done here, or you can bake the cheesecake at a really low temperature. Both helps, but sometimes you cannot prevent that one crack from forming. 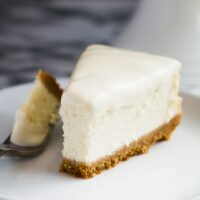 More cheesecake recipes to try next! Deliciously creamy vanilla cheesecake on top of a cinnamon spiced digestive biscuit crumb crust and topped with a sour cream topping! Preheat the oven to 180C/350F/Gas 4. Grease a 9-inch springform pan and set aside. Mix together the biscuit crumbs, sugar, cinnamon, and melted butter. Press the crumb mixture into the prepared pan, and bake for 8 - 10 minutes. Cover the outsides of the pan with aluminum foil to prepare it for a water bath. Turn the oven temperature down to 150C/300F/Gas 2. Using a handheld or stand mixer fitted with the paddle attachment, beat the cream cheese, sugar and flour until smooth and combined. Beat in the eggs, one at a time, then mix in the vanilla and yogurt. Pour the batter onto the cooled crust, then place the pan into a large roasting pan. Pour enough boiling hot water into the roasting pan to come 1-inch up the side of the cheesecake pan. Bake for about 1 hour or until the sides are set but the centre is still a little wobbly. Turn the oven off and leave the cheesecake inside for 15 minutes without opening the door. Open the door slightly and and leave the cheesecake for a further 30 minutes. Remove from the oven and leave for 15 minutes before removing from the water bath and allowing to cool completely on a wire rack, then chill in the fridge for at least 6 - 8 hours before slicing and serving. Mix together the sour cream, icing sugar, and vanilla. Spread the mixture over the top of the cooled cheesecake, and refrigerate until ready to serve. 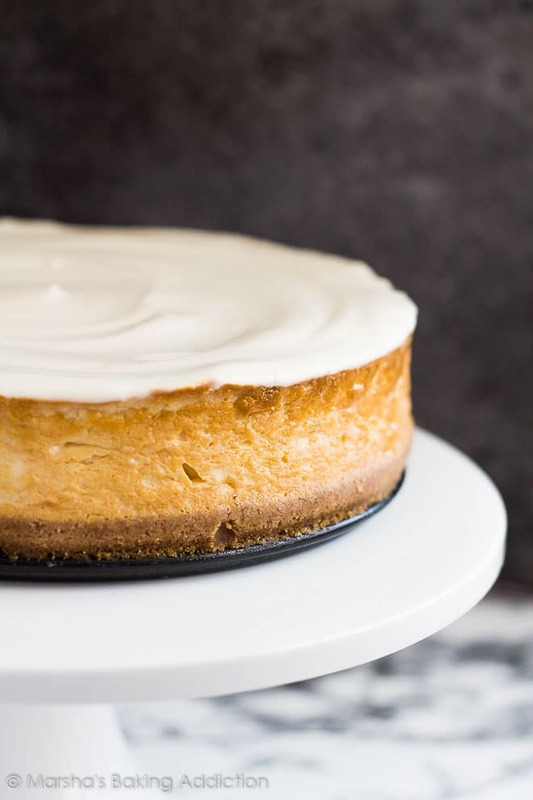 Leftover cheesecake can be covered and stored in the fridge for up to 4 days. This cheesecake freezes well, covered tightly, for up to 2 months. Thaw overnight in the fridge before glazing and serving. 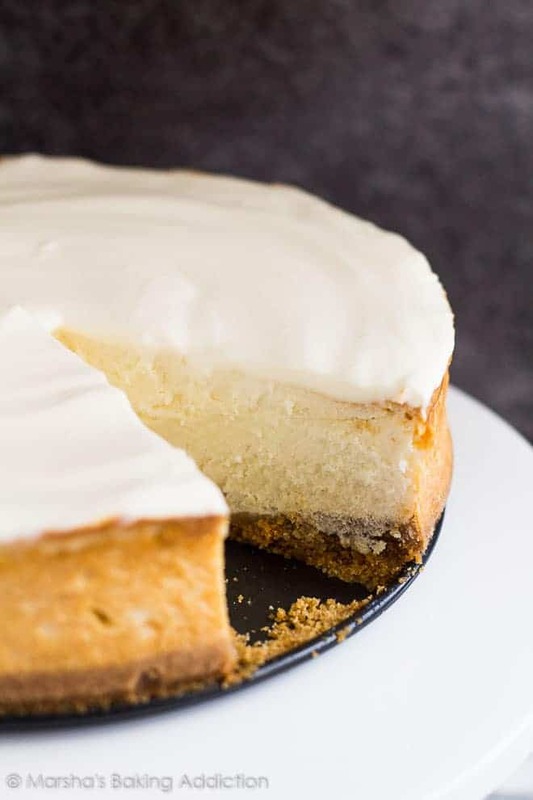 Your Perfect Vanilla Cheesecake are just gorgeous and so yummy! And so simple to make! Another great recipe, Marsha! Pinned! Oh wow, this cheesecake looks amazing, Marsha! LOVE that cinnamon spiced biscuit crumb crust and I’ll take extra of that sour cream topping! HEAVEN! Cheers! I am a cheesecake FIEND and this looks fabulous! I’ve never seen a sour cream topping like that before, and now I’m dying to try it! I LOVE cheesecakes! This sounds fabulous! What a stunning looking and delicious vanilla cheesecake, Marsha. Loving it. This cheesecake looks lovely Marsha! I definitely need to try your version! What a gorgeous cheesecake! I love that you use Greek yogurt in it, and the sour cream topping sounds divine! Hi, how does this freeze? We have a busy season coming up and i like to have desserts ready to pull out of the freezer. This cheesecake freezes well, covered tightly, for up to 2 months. Thaw overnight in the fridge before topping and serving 🙂 Enjoy! 4 cups of cream cheese equals how many pkgs., please. That would equal 4 x 8oz packages.